Ultrasound education is undergoing significant and innovative changes. There is a BSc (Hons) Medical Ultrasound programme running in its third year, with students due to quality in Summer 2019 and an apprenticeship standard has been developed for BSc (Hons) in Medical Ultrasound. These new courses are in addition to the many CASE accredited post graduate programmes and focussed courses currently available. To ensure the developments continue to provide high quality ultrasound services to the public there is a vast amount of strategic level work being undertaken by volunteers from a wide range of backgrounds. CASE member organisations are involved in the discussions and working groups, as any changes to education and practice will impact on the role of CASE in assuring the quality of new approaches. A summary of the work to date has been published by the Society and College of Radiographers1 and the British Medical Ultrasound Society (BMUS).2 This report provides a further update on the latest developments. Sonography Implementation Group are developing a career framework for ultrasound. To date they have approved the ‘Standards for Sonographic Education’ document.3 Current work is looking at defining a career for a four tier ‘profession’ for sonographers. This includes the scope of practice, reporting, accountability and career progression. Linked to this, other work is beginning looking at preceptorship and a capability framework, to support the transition between career levels. Sonography Training Group are reviewing options to increase capacity for clinical education, to try and take some of the pressure off over-stretched clinical departments. Several different options are being considered and the plan is to suggest a menu of different possibilities to meet the differing regional requirements. Currently the group are having discussions with colleagues who have already set up ultrasound clinical academies, regional peripatetic education models and ultrasound clinics within universities. Discussions are also taking place with Radiology Academy colleagues, reporting radiographer academies and sonographers in other countries, to share innovative practice. Sonography Regulation Group, led by HEE is currently putting together a case for regulation of sonographers. Evidence will be presented to the Professional Standards Authority (PSA), prior to submission to the Department of Health and Social Care for further consideration. Further dissemination and discussion will take place at the BMUS conference in December 2018 in Manchester, where there are professional issues streams on both Tuesday and Thursday, looking at education, training and professional developments. CASE has published a new guidance document entitled ‘CASE Standards for Sonographic Education’. This document, commissioned by Health Education England as an important step towards meeting the needs of the changing ultrasound education landscape, clearly identifies the standards that need to be met within/through sonographic education and training for non-medical practitioners known as ‘Sonographers’. Master of Science e.g. MSc Clinical Sonography or MSc Medical Ultrasound. This document was created to provide guidance on educating the future ultrasound workforce, along with learning outcomes for academic levels 6, 7 and 8, as a result of the increasing diversity of ultrasound programmes and courses. It is intended to be used as a resource by ultrasound educators and CASE accreditors; however, we hope it will be of interest to all those involved in the training and education of student sonographers. CASE is pleased to announce that the College of Podiatry has joined the Consortium with effect from 1st October 2017. The College of Podiatry (COP) was formed in 2012 to be the charitable subsidiary of The Society of Chiropodists and Podiatrists, the Professional Body and a trade union for registered chiropodists and podiatrists in the United Kingdom. The Ultrasound in Podiatry Specialist Advisory Group, Chaired by Dr Heidi Siddle, with the support of the Committee of the Directorate of Podiatric Medicine first approached CASE last year about joining the Consortium. The Quality Assurance Committee of the College of Podiatry operates a scheme of accrediting higher education programmes. There are currently 13 BSc (Hons) Podiatry programmes in the UK and a further programme offered at National University of Ireland, Galway which the College of Podiatry accredits jointly with the Society of Chiropodists & Podiatrists of Ireland. The College of Podiatry also accredits MSc programmes in the Theory of Podiatric Surgery, Podiatry (Pre- and Post-registration) and Forensic Podiatry. Others programme are currently in the development stage. Like the CASE member organisation IPEM, the College of Podiatry has been awarded Licensed Body Status by the Science Council allowing members of the College of Podiatry to apply to become a Chartered Scientist (CSci). Hence, the College of Podiatry are experienced in satisfying the CSci requirements to provide award status on behalf of the Science Council as well as ensuring all CSci members complete an annual CPD return. The College of Podiatry has acknowledged the increase in prevalence of ultrasound imaging by their members and subsequently identified the need to support the education of podiatrists and ultimately provide assurance to patients. 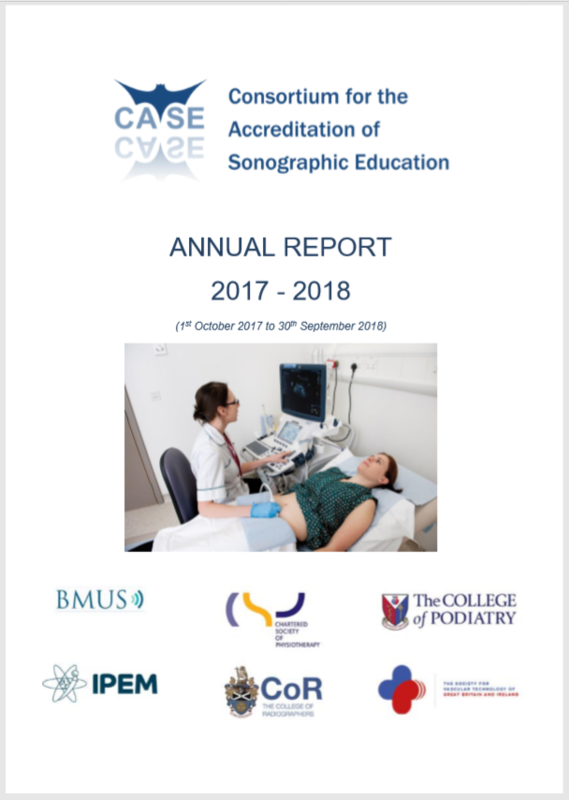 As a member organisation of CASE the College of Podiatry, through appropriately trained accreditors, will be able to support the accreditation of high quality training programmes and focused courses (including foot and ankle specific courses) that promote best ultrasound practice and ensure that ultrasound practitioners, including podiatrists are safe and competent to practise in order to maximize the benefits to patients. CASE is very excited to be working with our second new member organisation in as many years and we look forward to benefiting from the expertise and knowledge that COP will bring to the table. For more information on the the College of Podiatry, visit their website by clicking on the image to the right. Details of the CASE Committee Members who will represent COP can be found on the 'Who We Are' page.